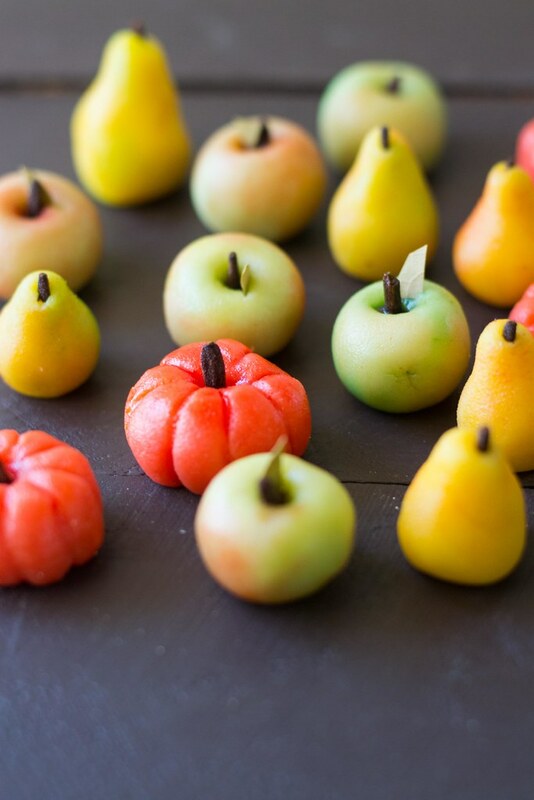 Whenever I think of the holidays or my childhood, marzipan fruits is the first thing that comes to mind! My mom engrave that into my head and we are both madly in love with the adorable fruits. Every chance I get I’ll send my mom a box to Hawaii, because I don’t think you can find them there and she yells at me that the box is already gone. Ha. mission accomplished. Then I saw this amazing tutorial and couldn’t believe how incredible easy it was! So one morning before work I laid out all of my equipment and let my artistry flow naturally. Therapeutic is what I found it, no cooking, just relaxing with some music, hand panting little fruits. Dare I quit my day job?? Of course I had to hire a model for this project. This was my first “painting” project since nearly 25 years, the first time I’ve picked up a paint brush and painted anything. And I have to say, I think these turned out absolutely adorable! The apple and pear stems are from little pieces of clove that I broke apart and same for the little pumpkins. I think the apples and pears were my absolute favorite! And the trick is to not overdo it with the dye colors, let the natural diluted look of the color fade and blend in. Have fun with these! Make different fruits, shapes and have fun! I think I may have a “Hawaiian” theme happening in the future. Little papaya’s and mango marzipan? How cute would that be?! 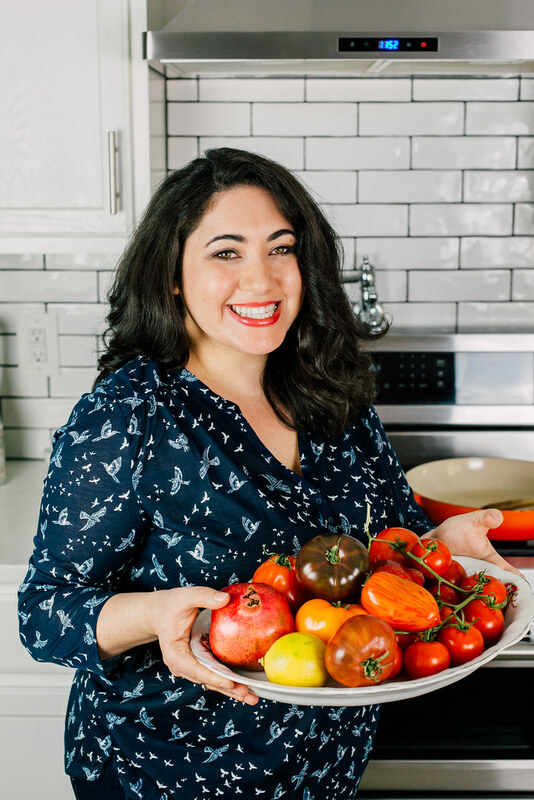 First, add 2 tablespoons of water to 3 small bowls and add a few drops of each color dye to bowls until you get a light yellow, light green and mix the yellow and red for orange. 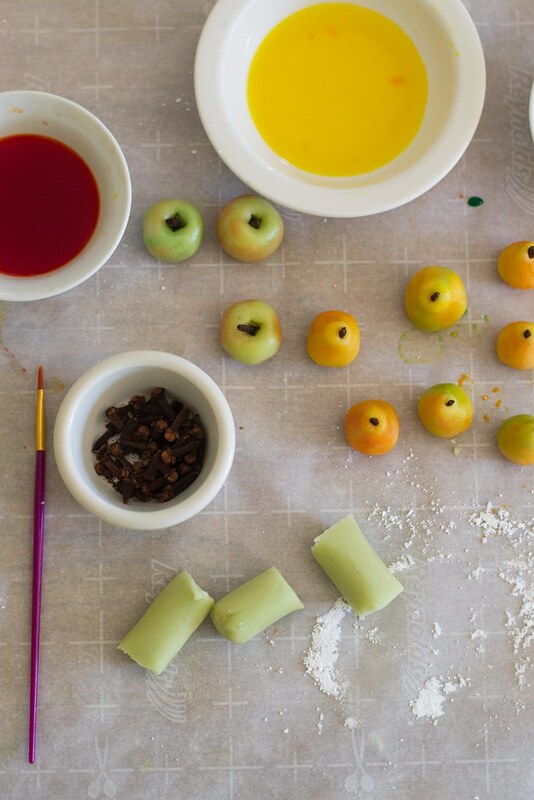 Then, divide your marzipan log into 3 equal pieces, each piece will be pear, apple or pumpkin. Take one of the pieces and knead about 1/8 of the green dye until evenly colored (this will be for the apple), then knead the yellow to another piece for the pear and finally the orange for the pumpkin. Dust some powdered sugar on your work surface and roll one of the pieces into a long log, you'll be this with the other 2 as well. Then divide the log into 6 equal pieces, each of these will be your little fruits. For the apple, roll it into a ball and stick a piece of clove in for the stem. You can also cut small pieces of bay leaf for the apples leaf. 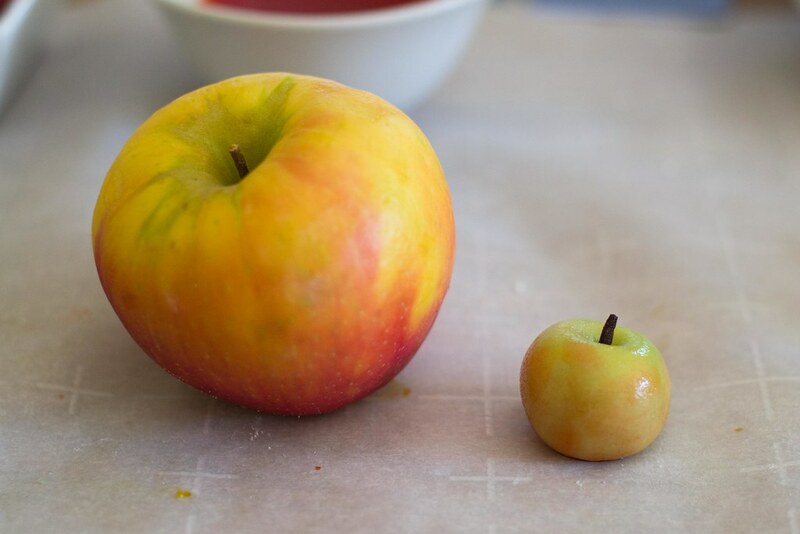 Use a paint brush to paint different colors of the apple. For the pumpkin, roll it into a flatter ball with a flat bottom. Use the paintbrush handle to make the indents in the pumpkin and top it with a piece of clove for the stem. Let them all dry on parchment lined baking sheet until ready to serve or give away. I love sugar cookies with royal icing on the holidays! Oh my! They are so cute! You did an amazing job! Thank you so much Ida!!! My favorite treat for the Holidays has to be tembleque, it’s a coconut custard made with cornstarch. It’s super yummy! I love making a berry “upside down” cake. Plain yellow cake as the base and semi-sweet cranberries or other berries up top. It’s not too heavy and just enough sugar to eat after large holiday meals. 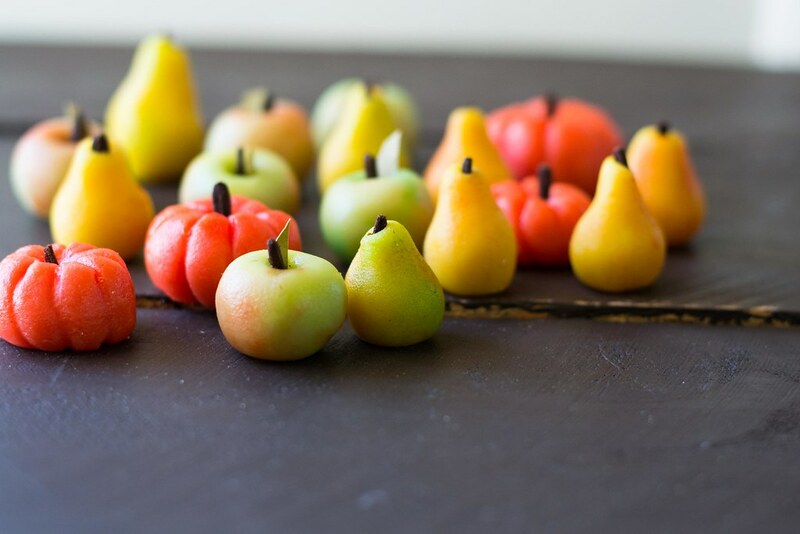 These marzipan fruits are just incredible! Such perfect replicas! Brava!!! 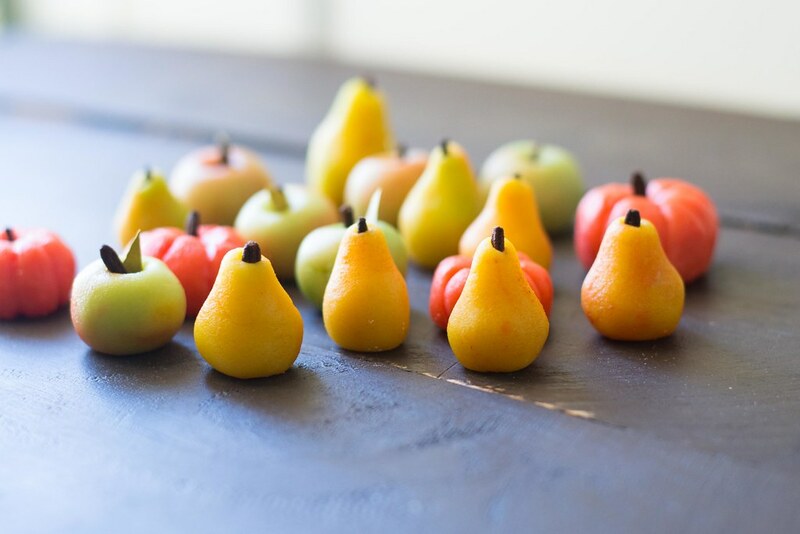 The marzipan fruits are adorable and so well done. They look too pretty to eat. Can’t wait to try these . Thanks Janet!! I’ll be making them again this year as gifts!